The preparation of the statement of cash flows (indirect method) can be a time-consuming task. Schedules become messy and cluttered as the schedule grows in length or complex transactions are introduced. This clutter oftentimes leads to unnecessary time, wasted energy, and the occasional error. The purpose of this template is to help those responsible for preparing a statement of cash flow to create one that is easy to follow, professional in appearance, and should also help in identifying errors common in formulas. This spreadsheet will not ensure your statement is error free – it is your responsibility to identify the appropriate classification, keep track of non-cash items, and to ensure the amounts are accurate. Looking for a list of common items that may need to be included within the supplemental cash flow disclosures? We’ve included several examples in this template. This statement of cash flows template includes the following features designed to increase efficiency and enhance professionalism. Decrease Cash Flow Statement preparation time. Learn how to alternate row highlighting. Link this statement to your balance sheet. Learn how to use dynamic formulas with the offset function. Set up to print to a single page. The following section has been added to the bottom of the statement of cash flows in order to identify some more commonly required disclosures. These disclosures can be within the statement or within the notes to the financial statements. As with the statement of cash flows, this listing is not intended to apply to all circumstances. Necessary disclosures may not be included in this list. 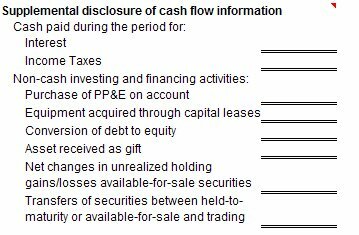 Note: Remember, the data included in this statement of cash flows is example data only. There could be items included that are not relevant to your financial statements, or items missing that require disclosure within your statements. The Software Product and any related documentation are provided "As Is." SpreadsheetShoppe makes no warranties, express or implied, and expressly disclaims all representations.